Do we need to keep the ISS? First, Putin invades Ukraine. Then, Obama imposes more sanctions on Russia. Putin sneers and goes about his empire-building business. Then, more sanctions. Then, NASA says it is suspending cooperation with Russia. So, Russia says we can’t get onto the ISS as of 2020. Since the only ride we currently have is on Russian rockets, they don’t exactly have to change the locks. Trouble is, I don’t think they own it – we paid way more of the actual development and construction costs, and most of the big parts were taken up there on Shuttles. The actual cost of construction is pretty hard to estimate, apparently. But I think it is safe to say that we built most of it, some ESA, some Russian, a little Japanese, etc. So how can the Russians say they are going to lock the doors? Well. because our manned launch capability is still a mess. Sure, Lockheed is building the Orion, but it is kind of an artisian thing – small batches, made slowly, by a few skilled folks. There’s no mass production – not even like the Apollos were built in the 1960s. Those are going to be the only NASA-owned manned vehicles by 2020, unless they buy or lease some from Sierra Nevada or SpaceX. They will probably opt to just buy seats, like they are doing with Russia now. On $ 17 billion a year they don’t have a lot of cash to throw around. So, let’s say 2020 rolls around, and we have no better relations with Russia than we do now, and they say, sorry, comrade, but no, it’s ours now. Are we going to take it by force? Probably not. Much as an orbital assault sound kinda cool, everything in space is just too damned fragile. You would lose too much space on a DragonRider if you had to armor the thing. Russian took firearms on the Almaz secret stations in the 1970s; I would expect they would find a way to put some weapons on the ISS, or maybe have a hunter-killer Soyuz variant ready to dispatch. Fact is, the ISS costs over $ 3 billion a year just to keep it going. I say, if they want it, let ’em have it. 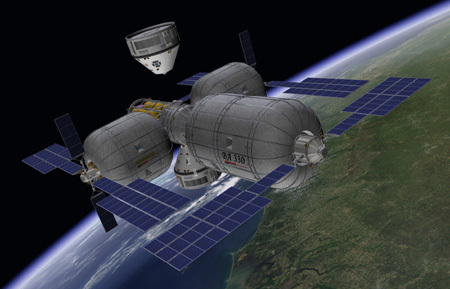 It was a fairly good idea thirty years ago, but let’s build some purpose-specific stations based on Bigelow modules that don’t have to be all things for all people. We have learned a lot from building the ISS, and we can leverage that in building the new stations. See, if the Russians have to shoulder the cost of the ISS completely by themselves, they may decide not to keep it running. Can it be deorbited safely? How much will that cost them? What if something lands on some guy’s house? Putin doesn’t seem to fear “world opinion” as much as we do, but the fireball in the sky caused by deorbiting the ISS will still be considered a massive waste, even by countries that have no designs on building a station of their own. So let’s give Vlad the responsibility of figuring out what to do with the thing. That kind of decision comes with being Emperor. And let’s get started designing some second-generation stations. Russia is giving us a chance to dump what will soon be a giant shiny white elephant. We can end up in better shape, for less money, and maybe even start building some stations that could really be prototypes for interplanetary vehicles.